Lövörgraven (Lövögraven) is situated 2 km south from the Lake Messlingen between Kappruskaften and Middagsåsen and it flows into the Anådalen valley. Lövörgraven is a small ravine and doesn’t have much in the way of dramatic cliff formations which are so characteristic of the ravines otherwise. It’s a nice place to visit though, much thanks to the wonderful hike (or bike) there and back. You also shouldn’t miss the rare wolf lichen which covers a tree stub on the viewpoint! 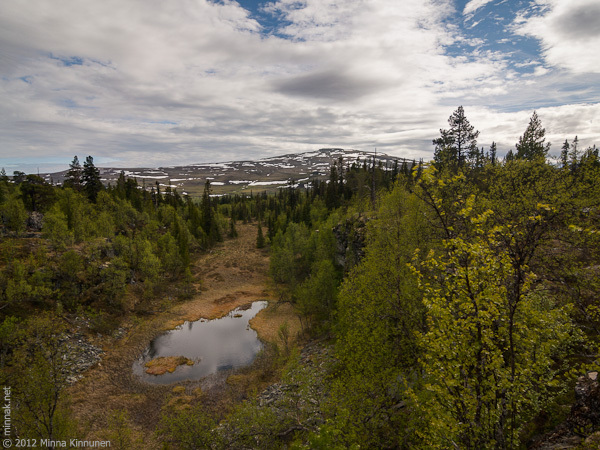 If you’re interested in reading more about Lövörgraven, check my blog post about the ravine. Directions: Head for the Mittån delta where the Mittån river flows into the Messlingen lake. Leave the car either by the tarmac road or by the gate further down the small road leading to the lake (but don’t drive down even if the gate is open). Mountainbikers with the skill and the condition can take the bike from here almost all the way to the ravine. The way to the ravine is easy, you just need to follow the double-track road/trail up to Kappruskaftet. It’s even marked with MTB signs. At the foot of the Kappruet peak, the MTB signs point in two directions, go left here. A bit later the trail branches again but there are no signs, go left and follow the tracks across the plateau. There are no trail posts but the tracks are strong and there’s no risk of getting lost. The tracks finally lead into forest, go in the forest just a little bit and then turn right. There’s no tell-tale signs like the ravines normally have but you’ll find the big embankments quite easily, even when covered with trees. If you stay on the west side of the ravine, follow the edge until you get to a nice viewpoint with a little bit of cliff formations and an open view towards Blåstöten. And keep an eye out for the stub covered with yellow-green wolf lichen! Apart from some small areas with wetland which are fairly easy to navigate without getting feet wet, the trail follows through hard packed land.